Manx rider Conor Cummins hopes to occupy the top step of the podium for the first time when he competes at this year's North West 200 on Honda bikes. The Ramsey man made his first road race appearance at the North West in 2006 at the age of 19 and eight years later is still chasing his first victory. His best result to date is a second place in the first 2010 Superbike race. "The North West was my first ever road race and so the event will always have a special place in my heart," he said. "I had never ridden a Fireblade until this year but I felt comfortable on it straight away at the first test," outlined Cummins. "What Honda don't know about setting up a race bike isn't worth knowing and that gives you added confidence," added the 27-year-old. In addition to his Superbike, Cummins will also race a Superstock-spec Fireblade in the colours of the RAF Reserves team, alongside a CBR600RR for Jackson Racing at Portrush. 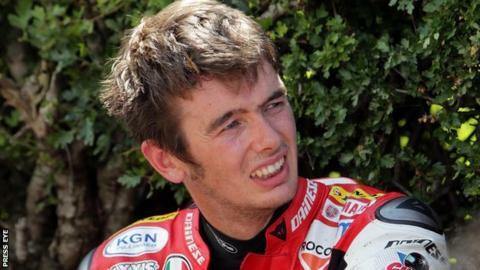 Cummins made his bow between the hedges after serving his apprenticeship on the British short circuit scene, but his road racing career was almost brought to an abrupt end because of a major crash in the Senior TT on the Isle of Man in 2010. His link-up with the factory-backed Honda Europe team for 2014, follows previous associations with Kawasaki, Suzuki and Yamaha outfits. A combination of ill fortune and machine failure have dogged his progress in recent seasons. After recovering from the extensive injuries he suffered in 2010, Cummins was signed by Tyco Suzuki for 2012 but a crash at Mather's chicane at the North West 200 left him with a broken hand and destroyed his whole season. He bounced back in 2013 with the Milwaukee Yamaha team but the Manxman now admits that he never got to grips with the fearsomely fast R1 Yamaha. "I was 20 seconds off the pace of the fastest lap in the Superbike race at the TT last year," explained the former bank official. "The bike was superfast, topping all of the speed trap speeds, but the team just couldn't get it to handle. The bike was riding me and I didn't have the confidence to push on." Cummins did manage to salvage a podium in the 2013 Lightweight TT for Ryan Farquhar's KMR Kawasaki squad. But the quiet man of road racing wants to make his mark in 2014 on the factory Honda. "People can get overawed and carried away in this position but I don't see it that way." he says. "Honda has given me bikes because they think that I can do the job. They want to win and so do I."